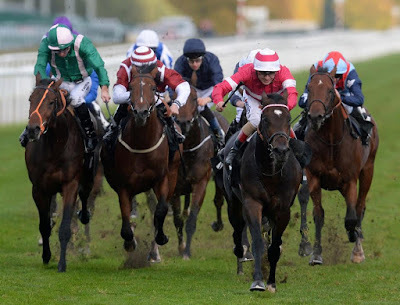 Bronze Beau (98) 12/1 a possible front runner and my joint 2nd top rated Landing Night (98) 10/1 could be the 1 to prosper if they go off too fast PEA SHOOTER (100) 25/1 another possible front runner and could be hard to catch if getting to the front, the trainer and jockey have got double figure winning percentages and at the price, I will be backing the selection each way. Goring (96) 25/1 usually held up for a late run but this race might not be run to suit it Englishman (98) 25/1 done its best time over this course and distance so could make the frame. UPSTAGING (100) 9/2 a versatile type but maybe doesn't want it to be too firm. Liberatum (98) 9/1 usually races prominently and could stay onto make the frame Archimeded (99) 12/1 usually likes to track the leaders and could make the frame SHACKLED N DRAWN (100) 25/1 can track the pace or be held up for a late run and has good trainer win ratio of 21% and the jockey has a 23% win rate for the stable so hoping that points to them expecting a big run here and at such a big price I will be backing it each way.